The foundation of the network is student-run clubs at universities and colleges across the country. The network is growing rapidly and includes participants from groups such as the Nano and Emerging Technologies Club (NExT) at the University of Virginia, the Unmanned Aerial Vehicle (UAV) Club at SUNY Polytechnic Institute, the Society for Emerging and Nanotechnologies (SENT) at the University of Central Florida, the Collegiate Nanotechnology Society at Virginia Polytechnic Institute, and the Nanoengineering and Technology Society (NETS) at the University of California, San Diego. Students from several other schools are working to establish groups at their institutions. promote opportunities for students interested in research, innovation, and entrepreneurship. Students in the network attended the 2018 Nano and Emerging Technologies Student Leaders Conference. Co-located with TechConnect World Innovation Conference and Expo and the National SBIR/STTR Conference. 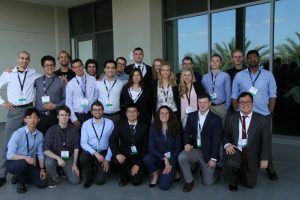 The Student Leaders Conference highlights undergraduate research and connects students with entrepreneurs, industry leaders, venture capitalists, and representatives of Federal agencies funding research in emerging technologies. To learn more about the conference from the students who attended, check out the 2018 Student Leaders Conference video above. The 2019 Student Leaders Conference will again be co-located with TechConnect and take place from June 17-19 in Boston, MA. Do you have a student group dedicated to raising awareness of nano and emerging technologies? If not, are you interested in starting one at your school? To join the conversation, email nanoed@nnco.nano.gov.